For the last twenty years, the outsourcing of various business functions has become commonplace for companies across the industries. Sean Pepper, a partner in Deloitte’s outsourcing practice, claims that “clients are increasingly addressing technological partners when it comes to innovation in digital, automation and analytics fields”. According to Computer Economics, the percentage of the total IT budget being spent on outsourcing grew from 10.6% in 2016 to 11.9% in 2017. So the question is: with all that buzz around outsourcing, how could decision makers know whether their companies need it or not? Is outsourcing a marketing bluff or the real thing when it comes to boosting business efficiency and growth? If you want a quick answer, well, it is worth creating an IT department when a company is large and has plans to develop its IT strategy. Secondly, it’s worth your efforts when IT technologies are vital for solving business problems. And finally – although it goes without saying – when you have significant funds to invest in creating your own IT department. So again, do you really need outsourcing? Of course, if a specific solution to a specific problem is required, there is no point in recruiting a staff of developers. For instance, file server issues. Being a business owner, do you have to deal with this? Of course, not. Your expertise and time resources should be focused on running and developing your business. 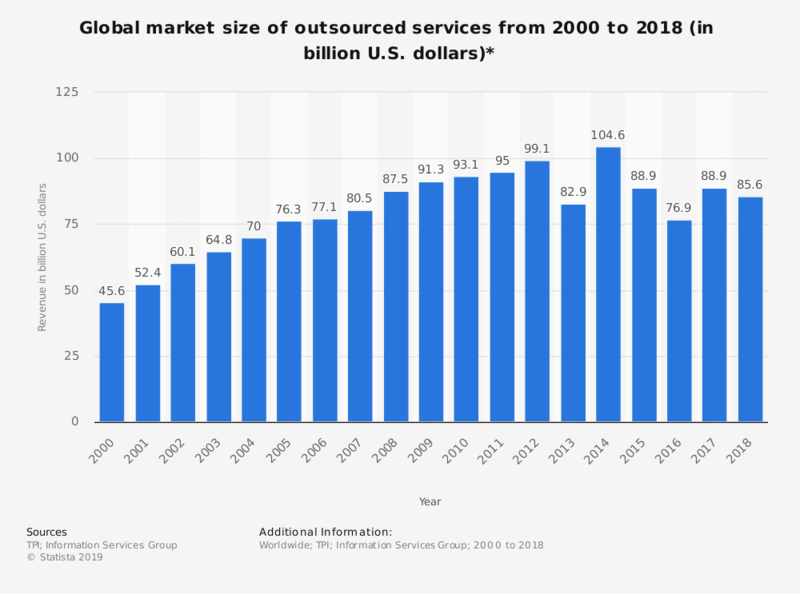 After all, it’s in the core of the idea: outsourcing is the ability to quickly attract the right specialists to do specific tasks and, thus, concentrate on business’ growth. It’s about saving money too. While working with a team of technological partners, you pay only for the hours of work, and not for the time of their lunch, seek leaves or vacation. The second case is if the task is large-scale but supplementary. For example, the development and support of the website. Sure enough, you can do it on your own, but most likely your IT-department is loaded with other more important things. So if you understand that a non-core project is going to take a while, it makes sense to involve third-party developers supervised by a small internal IT team. Global companies have their own specifics. In most cases, there’s a need to coordinate the work of branches scattered around the world into a single network. For example, at Schneider Electric, purely internal global projects are successfully developed and supported by external teams from different countries under the control of top managers from headquarters. Such projects include a single authorization system in all SE services for partners of a company or a product ecosystem. At the same time, the degree of involvement of such outsourced employees in all processes of the company is so great that they differ from the regular ones only by the postal address and physical location. On the scale of a company operating in a single IT infrastructure for all countries, this approach has obvious economic feasibility. With all the advantages as rapid response or involvement in the project, staff members require more attention. First, they may become too immersed in their internal specifics, get used to their standard tasks and stop developing. The qualification of personnel is one of the components of success, especially in such a field like IT. If you ignore this, your competitors working with dynamic contractors will pass you around the bend in no time. Secondly, staff members may get sick, go on vacation or take time off for family reasons. If they are not available, the load is distributed to the rest of the team members. In the case of dismissal of a full-time employee, the selection and adaptation of a new specialist takes a lot of time and effort. This is the situation where the outsourcing model comes handy: a professional contractor can quickly replace a member of the team, and the replacement will not affect the work process. In addition, the number of specialists in the internal IT department is limited. This is a normal situation if a company deals with continuous revision of the project or support of a single large product. But when there are many projects and they are different, it is necessary to either inflate the staff (which makes no sense) or to outsource some of the tasks anyway. The next stop is the risk of information leakage. If a full-time employee decides to violate a non-disclosure agreement, customer data and partner bases can be obtained by a new employer. An employee knows more about internal processes than a contractor does. In the case of information leakage, the company risks losing both profits and customer confidence. If you decide to work with a third-party, carefully study the estimates and feel free to ask questions. Despite the huge level of competition, no one wants to work at a loss. However, while some software development companies openly show their profits, highlighting it in a separate article (agency commission), others can use some complex (and obscure) IT terminology to hide a bloated budget. They may unreasonably increase the number of working hours, or even add extra steps to the project. A high price is not a guarantee of quality. Paradoxically enough, but regular contractors suffer from overstated estimates of major players on the IT market. What happens next? They come up with fair development costs and get eliminated by the client with the verdict “suspicion of dumping”. Don’t ever enter in an agreement with cheap yet unqualified development teams. To be certain you’re looking for the proper talents at an adequate price, you should draw a plan and do detailed research in several steps. Specify all the basic characteristics, features, and business requirements of your project. Is there a similar solution on the market? Do some research, it will greatly help you with the requirements. If you represent a non-tech company, most likely you don’t know how to outsource software development. In this case, just contact your potential technical partner and tell about your project idea. Any professional development company will help you with comprehensive business research, conduct proof of concept and suggest appropriate solution. Let’s agree that you made up your mind on hiring external resources. Now it’s time to go searching on the Internet. There is a multitude of platforms for hiring software developers like Upwork or Freelancer.com. Some of these websites offer freelance individuals or teams, others give you an opportunity to select from top talents at a time-proven company. One way or another, always choose proven contractors. Carefully study the reviews on both their website and hiring platforms. An unprofessional outsourcer is there to only make money on a project so you will have to control literally every step. This makes this kind of a “partner” no more than a thoughtless performer and reduces the benefits of such “partnership” to zero. In this case, the mistakes can be found out after the project is over. But guess what: the contractor is no longer accountable for anything. P.S. Interested in more outsourcing insights? Check out the article by Gennady Sergeenko, Elinext’s Head of Web Development, in which he touches upon a vital topic for professionals in the software development industry – what happens if a customer delegates a project to a new team of developers.